The Diocese serves this geographical region through its 63 parishes, four schools, Samaritans, Anglican Care, Anglican Savings and Development Fund and a number of chaplaincies. We minister people in rural, regional and city areas. You can find your local church through our Find A Parish page. Our Diocese is one of the 23 Dioceses that make up the Anglican Church of Australia and is led by the Bishop of Newcastle, Bishop Peter Stuart, and other ministry staff. We are focused on outreaching to the community and many of its parishes are becoming Ministering Communities in Mission. The social welfare arm of the diocese, Samaritans employs over 500 staff in areas of disability, youth, children’s and community services. There are also more than 400 volunteers, many of whom are parishioners, assisting with emergency relief and recycling programs. The diocese has four schools – Manning Valley Anglican College, Bishop Tyrrell Anglican College, Scone Grammar School and Lakes Grammar – An Anglican School. The CEY Commission (Children, Education and Youth) works to nurture, encourage, facilitate and resource ministry with children, young people and their families. 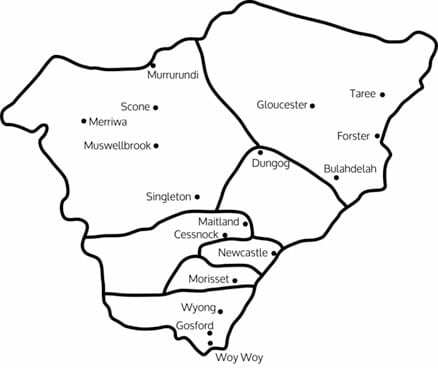 The Anglican Diocese of Newcastle is located in the state of New South Wales and extends along the coast of the state from Woy Woy to Laurieton and inland to Merriwa and Murrurundi. The cathedral church of the diocese is Christ Church Cathedral in Newcastle. 63 parishes exist within this area. We are a growing people of God celebrating our vocation as vibrant Anglican disciples of Jesus, engaging in mission that leads to personal and community transformation. We are a Missional Church building communities that make known the Kingdom of God.